In our previous blog post we covered how to create a custom Microsoft Word template to generate Customer Ready Quote using Document Generation feature introduced in Dynamics CRM 2016. In this blog post, we will see how to auto generate Word Template and most importantly, how we can send auto generated Word Template as an attachment in Email. The one purpose of auto generating the Word Template in Dynamics CRM is to save some user clicks. For example when a campaign is mark as completed, user has to generate campaign summary ( Word Template) and send it to owner of the campaign. If user has to do it manually, he has to generate the Word Template first then create an email and send it to the owner. Instead of, one’s need is to automate this process. Whenever the status of campaign is set as completed, generate the campaign summary and email to owner. To achieve the functionality, we will have to create two workflows. First Workflow will run on Status Reason field change, It will generate word template and save in Notes entity as attachment. Second Workflow will be a custom workflow, that will create an Email record, get document from Notes entity, attach in email and send the email at the end. Below is step by step guide to auto generate Word Template and attach in Email. From the Settings page. Go to Settings > Processes. Create a new process of type “Workflow” on the Campaign entity. Set scope to run for Organization. 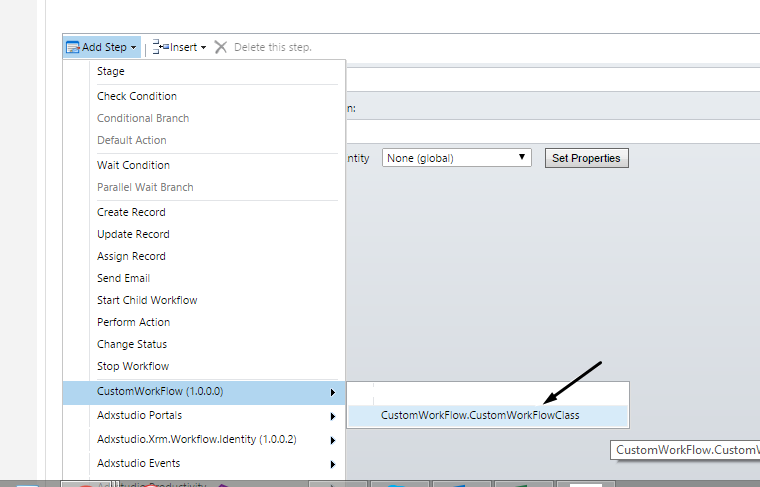 Configure the workflow so it is set to execute on “When Record fields change” and select field as “Status Reason”. Click on Add Step > Check Condition to add the first clause where we will check if the Status Reason of campaign is completed. 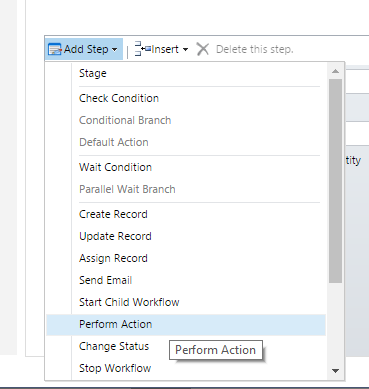 Select the row and click on Add Step > Perform Action. Select Action as “SetWordTemplate” from the dropdown and click on “Set Properties”. Select “Selected Template” as the template you want to be auto-generated. In our case we will choose “Campain Summary”. Select Target (the entity record you want the template to be attached to) to be your Campaign. This should be automatically selected when you click in this field and you can just select “OK” on the right hand side to place the mapping in the field like the picture below. First Workflow is complete, save and activate the workflow. 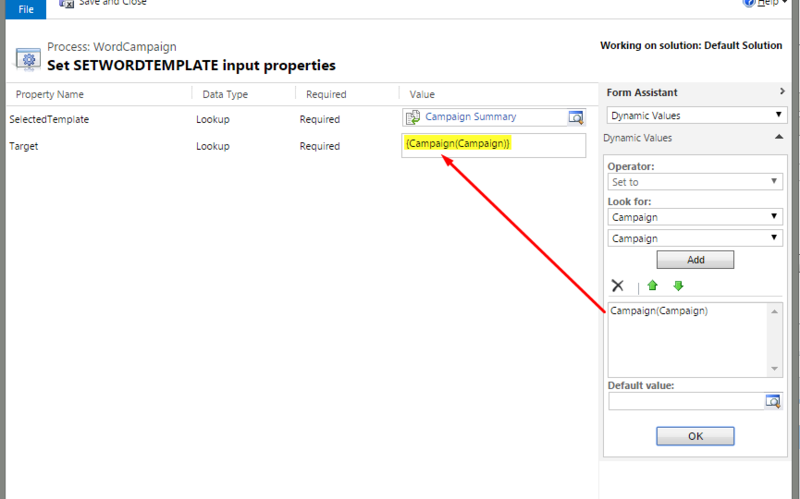 What this workflow will do is when the Status Reason of Campaign record is changed to Completed, it will auto-generate the Word Template (Campaign Summary) and attach it as notes. As we have to get the attachment from Notes, and send in Email as attachment. There is no OOB way to access attachment from notes. So we have to write custom workflow where we will get attachment (Word Template) from annotation entity and will create activitymimeattachment record. After that we need to create email and associate with it. After creating the custom workflow, we will run it from our main workflow that we have created above. Build the assembly using the code provided below and register in Plugin-Registration Tool. Open and deactivate the first Workflow we have created. Add custom workflow steps from Add Step. 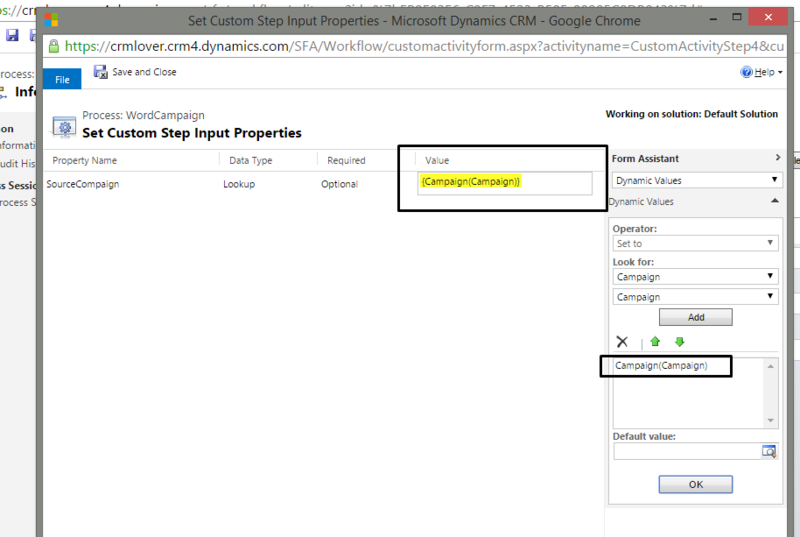 Set Campaign lookup as Input Parameter that we have specified in custom workflow. Auto-generate the Word Template (Campaign Summary) and attach it as notes. Create a new Email record. Get Campaign Summary from the Notes Attachment. Create new Email Attachment and attach to Email created before. Send the Email to Owner of the campaign. Our purpose was to provide user with automation of generating Word Templates and automate the Email Process.It’s really simple and you could actually create some really complex and interesting scenarios with this functionality. Can I generate the Word template for custom entity using workflow ? Yes you can generate Word Template for custom Entity. Steps are same as mentioned above. We have done it for campaign entity. You can modify it for any any custom entity.